The battery-operated, mobile hydrogen generator for on the road, for sports, hobbies, camping, leisure, in the office. Everywhere! Always with you: tasty, soothing water! Power for the cells. Instantly! Relax, relax, recharge your batteries! Also ideally suited for the treatment of stubborn skin diseases! An enrichment for the kitchen of health-conscious people! 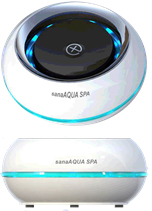 Instant hydrogen water at the push of a button. Turn every still water into an experience!